This is Red! I love him to pieces! Sadly, he is not mine but I ride him in lessons every summer! He is the sweetest gentlest horse ever! Though, sometimes I have to whip him because in the dressage ring there is an opening and it does not close and yeah he wants to go back to the stable to eat his lunch. Silly Horse! Well there you have that is me riding my sweet lesson American quarter horse gelding named Red. Thanks for reading! 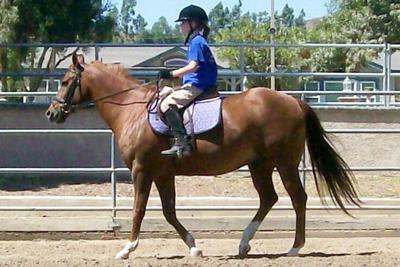 Sorry but your posture is wrong-- your heels in to be pointed down, back strait, the reins also should'nt be so high up and the saddle is a little far ahead-- remember to draw an straight imaginary line from your back to heels!! Sorry I just thought that might help a little.